Why will Hillary probably be our next president? Two facts: 1) the Republican Party is being perceived as mired down with Iraq and other problems, and 2) there are no inspiring pro-life Republican candidates to inspire the religious right! Unfortunately, I am fearful that the Republicans will NOT inspire the religious right to donate, campaign or to get out the vote. This is why I am STILL afraid that Hillary will be our next president, like I predicted 6 months ago. If the Christians — including both Evangelicals and Catholics — are not motivated to fight, I fear we will lose to Hillary by default. I pray that I am wrong. We should all pray that the Republicans can pick an outstanding candidate and that the religious right will rise up strong to do the right thing. 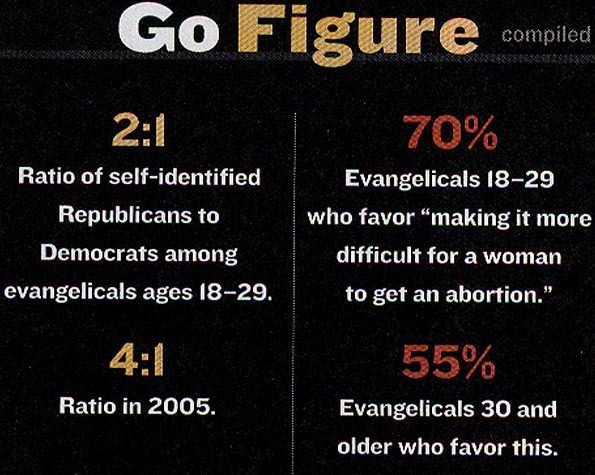 But looking at the statistics for the current Evangelical young people in the chart above (only 2:1 Republican today compared to 4:1 in 2005) it does not look promising. And what current candidate can really inspire the orthodox Catholic vote — Giuliani? Christians better begin to pray hard and work hard. “Christians better begin to pray hard and work hard.” Steve, you are right, and that’s exactly what many orthodox Catholics are doing for Ron Paul. Check out CatholicsforRonPaul.com, Mark Shea’s blog and the Caelum et Terra blog. Especially interesting is Thomas Wood’s “Open Letter to Catholics” at the CatholicsforRonPaul site. Woods makes the case that Paul is by far the candidate who most holds to Catholic values. i.e. abortion, the war, home schooling etc. Interestingly, he has a son who is a convert. On another subject, I’ve been meaning to tell you that your DVD’s are a great classroom tool in the high school where I teach. Why you’re almost a “cult figure” (in a good way of course!). Unfortunately, I have had the same doom & gloom feelings as you have expressed, Steve. Oh, we will be in big trouble if she wins. I guess Steve your prediction was wrong. We now have Sarah Palin.